We want to thank you for your prayers, love and financial support for our dear children. You are such a blessing and we thank God for you. The winter has gone during which we had lots of colds and flus but everyone is good now and back at school after the break...here are a few highlights for you to enjoy. All of our 5 older children had good school reports and their teachers are happy with them. They all enjoy school and are eager to attend and learn, Praise God. We asked you before to pray for Daniel and we have seen a great improvement over the past month, Praise God! He is much better behaved at home and school and has settled down quite a bit. Please keep praying - we have seen your prayers answered already! Joseph and Daniel are playing basketball at school and are really enjoying it, Joe is a great wee lad, well mannered and helpful. He is always laughing and happy. Pray for these lovely boys as they have great potential that we want to see fulfilled! Grace is looking forward to another school trip this term, she has caught up in her Shona language and is very happy now summer has arrived as she is keen to get back swimming again which she really enjoys. Blessing and Hope continue to be a great help with the smaller children. They have lots of patience and play dress up and organize games for them, these 2 girls are wonderful with Kuda and Joshua also, always fussing around them and pushing them in their strollers- what a precious gift they are. 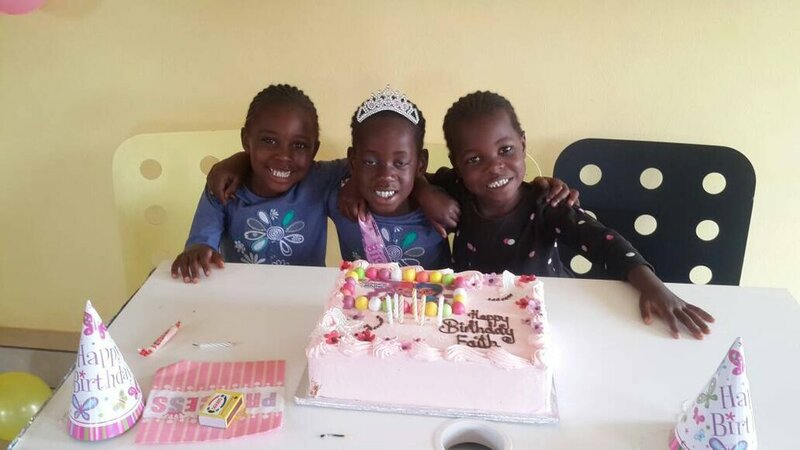 Faith celebrated her 6th birthday this month and had a huge cake , (we thank God for our friend Sylvia who bakes and donates the cakes for all the children's birthdays) and gifts from our friends in California. Faith is coming on well and talking and remembering things much better. Being at school has helped her greatly. Sarah spent a day hooked up to a drip after becoming dehydrated a few weeks ago but has made a full recovery. Abigail, Esther and Hannah continue to run everywhere and their teacher says they are good girls in class. They all love to dress up with the big girls and get make up and lipstick on, they are so precious and make us all smile.....most of the time! Kuda and Joshua are very contented and happy and are both eating well and enjoying the warmer weather. They both dislike the cold winter time. We will be organizing some swimming pool therapy for them this term to try and keep their limbs free and loose. Dorothy and I have moved full time into Jabulani now after selling our house. We are refocusing our lives and ministry as we leave CEF after 32 wonderful years as full time Missionaries. We will continue to live in Zimbabwe at Jabulani with our children and continue fund raising for their future. We are available to speak and preach when we in the UK, Europe and in USA. We praise God as He is the one who opens doors and we look forward to continuing to be busy serving Him. Please continue to pray for us all at Jabulani, the future is bright and we march toward it with great confidence in our God who can "do immeasurably more than we can ask, think or imagine" Ephesians 3:29. We love you and thank God for you, every blessing in Christ Jesus.